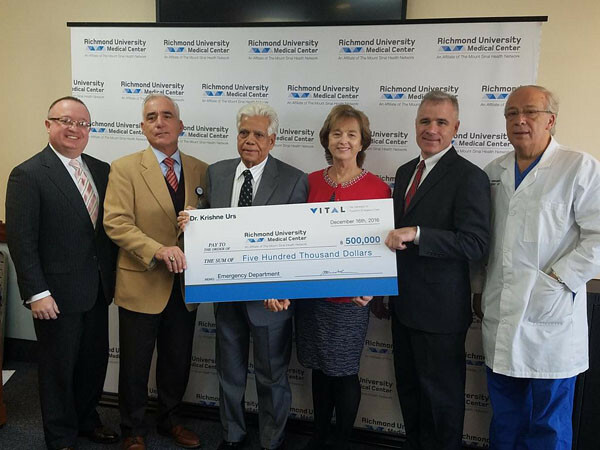 Dr. Krishne Urs, an orthopedic surgeon and philanthropist, has given half-a-million-dollar in donation to Richmond University Medical Center for its emergency department construction project. Dr. Urs’ pledge will go toward the medical center’s $65 million project, according to a report in Silive.com. The donation a $500,000 donation was made last month made during a ceremony in the hospital’s MLB conference room. Daniel Messina, president and CEO of the hospital, accepted the donation from Dr. Urs, and thanked him for his generosity. “We would like to celebrate a very dedicated physician of the RUMC family and recognize Dr. Krishne Urs,” Messina was quoted as saying in the report. Staten-Island based Dr. Urs received his medical degree with distinction from the University of Mysore in India. He arrived in New York City in 1962 and studied to become an orthopedic surgeon. HE began his practice at St. Vincent’s Medical Center, which is now Richmond University Medical Center, in 1970. From 1986 to 2001, he served as chief of orthopedic surgery at St. Vincent’s Medical Center. Dr. Urs discussed the significance of the new emergency department project and what it means to give back to the community. “As many of you know, our community continues to grow and demands have been put on our hospital, especially our emergency room,” he said, according to the Silive report. He said the hospital has been treating over 65,000 patients a year in a space originally designed for 22,000 patients. “I have spent my entire career in this hospital and it has been part of the fabric of my life and livelihood and I’m so grateful to give back to this organization and the people that it serves,” he was quoted as saying. Richmond University board chairwoman Kate Rooney quoted Dr. Urs as saying that when an opportunity arises to invest in infrastructure that is linked to such a vital community cause, “it gives the donor an opportunity to have a lasting impact on the lives of their children and their grandchildren,” according to the report.